You all know how much I love a Daily Prompt. Today’s is: You have to spend one day as or with your favorite fictional character. Which one would it be and what would you do? Gosh, the possibilities are endless. On one hand, I’d love to say Katniss or Tris, but I wouldn’t want to be hanging out in situations where I’d need weapons and protective gear. Also, I’m not confident in my ability to train hop, jump off buildings, or save the world. I know what you’re thinking. Olivia could benefit from weapons and protective gear with her crazy life. But if I were her for a day, I’d change everything. First, I’d wake up in her comfy-looking, fluffy bed and power down the damn cell phones. Everyone’s always bothering her with their problems. I’d spend a minute reflecting on my choices- good choices like the wine I had for dinner last night, and bad choices like when I trusted my parents with stuff. Then, I’d saunter out of bed and hang out in my closet, admiring my lovely wardrobe. The cardigans! The coats! The handbags! The shoes! I’m not much of a fashion plate in real life but with Olivia Pope’s closet I could easily change that. Tailored, classy, and covered up with touches of femininity, nothing beats Olivia’s style. Since I would only be Olivia for one day, I’d choose my outfit wisely and get ready for the office. I’d head over to OPA (Olivia Pope Associates) and deal with the crazy people at work. Talk Huck off a ledge, keep Quinn from going totally nutso, call Abby and ask for a selfie so I could see how lovely her hair looks that day. Maybe I’d sit in my awesomely dark and mysterious office and actually do something like . . . paperwork. Olivia never gets her paperwork done. Her business is probably a shambles. Or maybe I’d borrow one of Huck’s hacking laptops (making sure not to “X” out of his illegal, yet useful, activities) and play solitaire or email my friends for lunch. Wait. Olivia doesn’t have friends. Okay, so maybe I’d call Mellie (the First Lady and my President Lover’s wife) for lunch. We’d eat salads and partake in cocktails, compare notes on Fitz, plan her run for Presidency. You know, girl talk. Maybe I’d invite Susan Ross, the Vice President and probably the only person on the show who really cares about the American people, to hang with us. 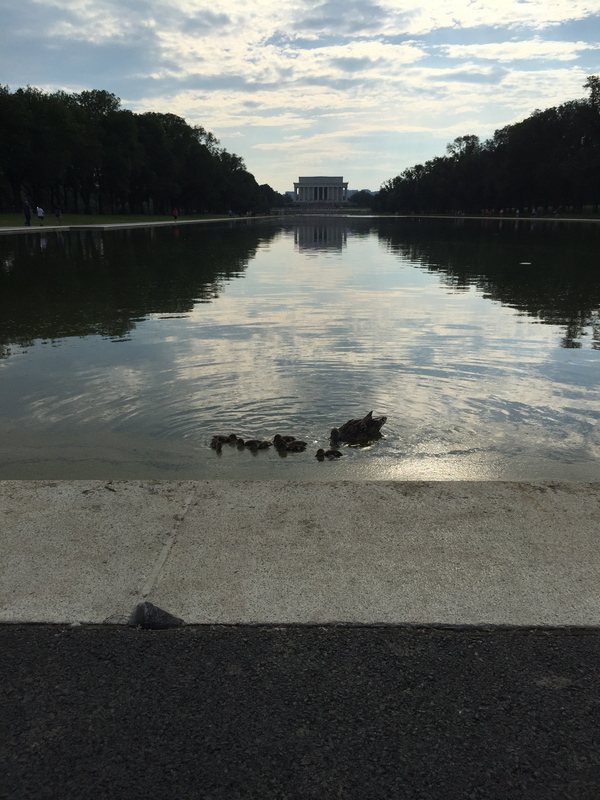 Reflecting Pool and Lincoln Memorial. Duck Family. Sunset. When I returned, I’d take off my heels and settle in for the afternoon. Or maybe I’d just go home, slip into something more comfortable like a flowy, white sweater, and pop open a bottle of wine. I’ll tell you what I wouldn’t do if I were Olivia. I wouldn’t take any calls from my father, that’s for sure. I’d probably avoid watching the news. Whenever Olivia watches the news she ends up fixing some jerk’s mess. I certainly wouldn’t respond to Cyrus, Charlie and the B613 crew, or Sally Langston. Nor would I partake in the Jake-Fitz-Me love triangle. Anyone who pops up on Olivia’s phone as a known contact is nothing but trouble, and my day as Olivia would be trouble free. If I were Olivia, I’d have her join a book club in the suburbs, or go to a movie or a yoga class. Doesn’t Olivia need a day like that, folks? Her life is exhausting with all those men and terrorists and politicians. She spends her days dealing with drama and then what does she do for “fun?” She runs around D.C. with her earbuds blasting seventies music. Well, running is great and Olivia has a good shuffle of tunes on her iPod, but I’ll tell you, that’s not going to happen with me possessing her spirit for the day. With me, Olivia would have one day of peace and rest while she lets the world crumble around her. I have a feeling that on Thursday’s premiere, Olivia will not be joining yoga class or lunching with Susan Ross. Of course there’s no way to be sure what ABC has planned, but it’s just a feeling . . .
Do you believe it’s on as I type this and I FORGOT to check the DVR? IT’S NOT RECORDING. Will have to watch On Demand with commercials. Meh.